As long ago as the Paris Motor Show last fall, Bugatti president Stephan Winkelmann has been talking about expanding the Bugatti lineup, but has been cagey about what might be coming. How can you possibly follow up the $3 million Chiron, the $5.8 million Divo, and the $12.5 million La Voiture Noire? According to Car, the French brand is putting together a Taycan-based long-wheelbase luxury EV, allegedly due some time in 2023. The company could certainly afford to build a more mass-market entry-level model for a million bucks or so, without the headline-grabbing 1500 horsepower output or 260 mph top speed. But what would that look like? When Winkelmann mentioned that the W16 engine might not be the heart of the big Bug forever, we were struck. Now that I’m hearing it could be an electric heart, I’m intrigued again. 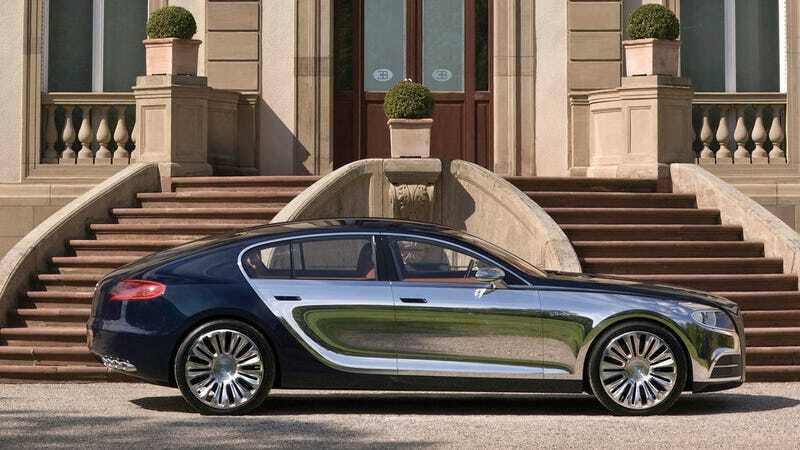 Bugatti is great at convincing very wealthy tastemakers to put up lots of money to purchase its cars. If a supercar maker can take EVs to a new level of desirability, perhaps we can get a proper infrastructure for them sooner rather than later. “I would see us doing a battery electric vehicle,” Winkelmann told Bloomberg at the Geneva Motor Show. “There, the balance between performance and comfort is much more important, and it’s about daily usability. This is what I see. By stretching the Taycan platform, Bugatti could have a viable product much sooner than engineering one from scratch. And developing a chassis good enough to be sold under the Porsche name would mean it’s engineered to a high standard. Perhaps not engineered to Bugatti standard, but they can fix that reasonably quick. While nothing moves quickly with a tiny company like Bugatti, especially when everything needs to be hand crafted, I would hope they can get something feasible before 2023. Car speculates that the car will make use of solid state battery tech, but being that this tech isn’t ready for prime time yet, I’ll hedge that bet. If it looks anything like Galibier concept (top) of a decade ago, I’ll smile every time I see one. I just hope Winkelmann sticks to his guns and never produces an SUV.